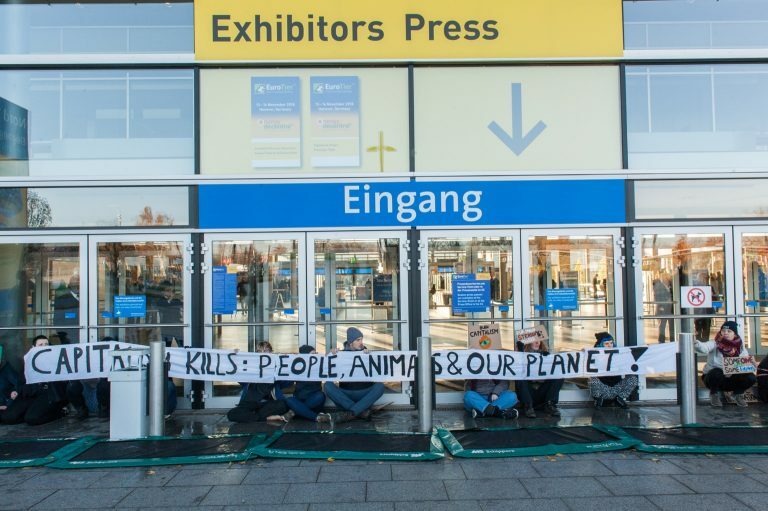 Following the Climate & Justice Games (www.climate-and-justice.games) at the fare EuroTier in Hannover, we would like to continue intersectional anti-capitalist struggles against the animal industry together with others. This year we therefore want to consult with others in order to plan a major mobilization for protests against animal production in the next year – 2020. Whether mass actions or action days; whether sit-ins of feed ports, creative protest against the EuroTier, occupations of lobby centres or disturbances of slaughterhouses or dairies – we want to discuss this together with you in an action conference! Our invitation goes out to initiatives and individuals who have an interest in getting in the way of the practices of animal production. We would like to invite citizens’ initiatives, activists of the climate justice movement, the animal rights and animal liberation movement, trade unions and agricultural associations to join us in disturbing animal production sensitively. The European campaign By 2020 We Rise Up has started on December 08. It aims organising a massive collective uprising for climate justice and system change in 2020. Animal Climate Action supports the campaign! On December 8, activists groups all over the world will be ringing a climate alarm. We have chosen this date to mark the beginning of an uprising for climate justice [http://by2020weriseup.net/call-out/]. With extreme weather events wrecking havoc across the globe, and while politicians and corporations perpetuate business as normal at COP24 in Katowice, we have no time to wait. It is up to us to solve the climate crisis. The plan: Throughout 2019 we will mobilize increasing numbers of people to put their bodies in front of the machinery causing the destruction. We will take action targeting the infrastructure and companies; the political and financial institutions at the root cause of the crisis. Collectively we will bring about the radical changes that our society needs in order to avoid catastrophic climate breakdown. groups from all over Europe decided to connect their struggles – against gas pipelines, coal mines, industrial agriculture, airport expansions and social injustices. From December 8 onwards, we will rise up together, building momentum throughout 2019, to organise a massive collective uprising for climate justice and system change in 2020. We will provide information about the Climate & Justice Games which are scheduled from 13 to 17 November in Hannover, Germany (see https:climate-and-justice.games). We will give background information, give practical advice and inform about possible targets for action. It will be possible to meet partners for the formation of affinity/action groups. Also 2018 the „Grüne Woche“ will take place in Berlin – the world’s biggest exhibition on food, agriculture and gardening, that attracts thousands of visitors from the 19th to the 28th of January. But behind this place of excursion and tasting event hides human oppression, ecological destruction and climate change, as well as animal exploitation, caused by the capitalistic (agriculture) system. We will be at this place of glorification multiple times during the exhibition. We want to inform the visitors about the unacceptable status quo of the agriculture industry and express our protest against an agriculture that treats humans, animals and environment as products. Independent of conventional, ecological, with animal protection logo or sustainability award, this system is violent and ignorant towards the needs of all individuals that are part of it. During the „Grüne Woche“ the presentation of animal farming and industry has a major role and therefore gives room for informing about the global oppression of billions of feeling individuals, the irreversible destruction of the world climate and the exorbitant depletion of all our living environment. This is the reason we will show what is hidden during the „Grüne Woche“ with videos, banners , information materials and a picture gallery. With real images and true stories we will make the daily life of non-human individuals and the fatal consequences of the animal industry and agriculture for environment and climate transparent. For a solidary, fair, sustainable and together self-determined agriculture! Governmental officials from almost all countries of the world come together in Bonn to discuss how to mitigate climate change. At the same time, concrete actors are located in close vicinity, who make profits at the cost of the climate and who campaign a lot, so that it stays like this. With a rally in front of the main office of the DVT, we want to tag this actor and confront him with our protest. Afterwards, we want to draw attention to the fatal consequences of animal feed cultivation with a demonstration, and together walk to the event “The Struggle for Migrants’ Rights in a Context of Climate Crisis” of the People‘s Climate Summits at the site “Wissenschaftszentrum”. The production of animal feed and its feeding in animal production contributes substantially to climate change. The “German Association Animal Food” (“Deutscher Verband Tiernahrung e.V.”, short DVT) is the largest lobby of the animal feed sector in Germany, representing 280 member companies that constitute around 80 % of the German animal feed market. Among its members are major companies such as several subsidiaries of Agravis, BASF, Habema and MEGA Animal Food (a subsidiary of the PHW-Group with its brand Wiesenhof), and international companies like Cargill (US), ForFarmers (NL) and Provimi (originally NL, by now part of Cargill). By representing the interests of a business sector in which a lot of money is made by destroying the nature and the climate, of course they do not care whether climate change is actually stopped. Under the heading “Feed questions”, they avoid questions regarding climate protection more or less smart. They merely promise very vague improvements: a more efficient composition of the feed, so that one needs “less food for a greater outcome”; research into food that reduces methane emission; and the reduction of energy use regarding the animal feed production. Other deficiencies such as poor working conditions and the eviction of peasants, deforestation, extinction of species and over-fishing of the seas are not even mentioned. The DVT is an important player for securing the persistence and expansion of the animal feed industry and for politically enforcing the therefore required conditions. Effective climate protection plans are in conflict with their interests. Animal feed has a substantial share in these problems. In the course of industrialization, pasture feeding was increasingly replaced with intensive livestock farming. A lot of large farms emerged, concentrating a large amount of animals on a small space. In general, these farms do not have sufficient agricultural production land for the production of the required animal feed. That’s why it’s also called “landless animal production”. 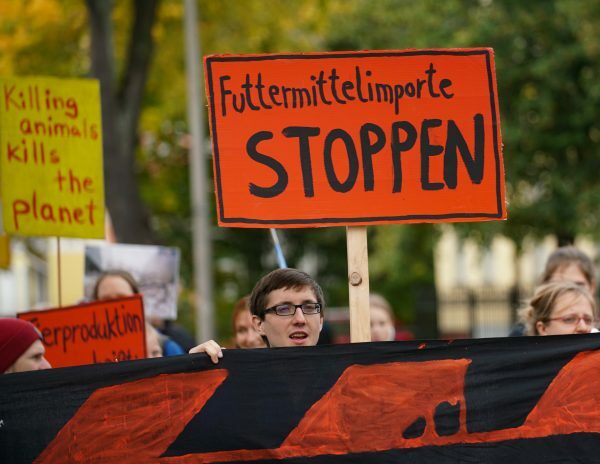 On Monday, the 6th of November, we will give a workshop with the title „Stop animal production, save the climate“ on the alternative climate summit „People’s Climate Summit“ in Bonn. The workshop will take place 9:30am to 12pm in the „Wissenschaftszentrum Bonn“ (Ahrstraße 45). Stop animal production, save the climate! feeding the world, in fact only the wealthy population benefits from it. Climate justice needs us all. That means you, too. an island state whose very existence is threatened by climate change. together to network, learn from one another, and empower each other. The network Animal Climate Action puts the spotlight on the connections between climate change and animal exploitation. Upcoming events: We’re participating in the Connecting Movement Camp and the Action Days in the Rhineland in August 2017. You can find more information here. If you’d like to know more or join a meeting, please contact us, we look forward to hearing from you!